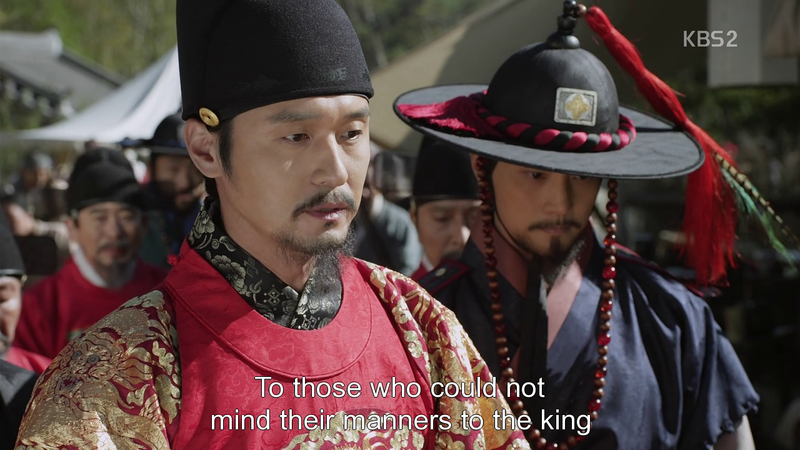 We begin with young Prince Sejong being told that his is a face that bodes unrest for the kingdom, should he ascend the throne. The prince is not too happy to hear it and we see a cruel smirk cross his face as he stares at the face reader…who pulls a sword on him? Okay that was fast. 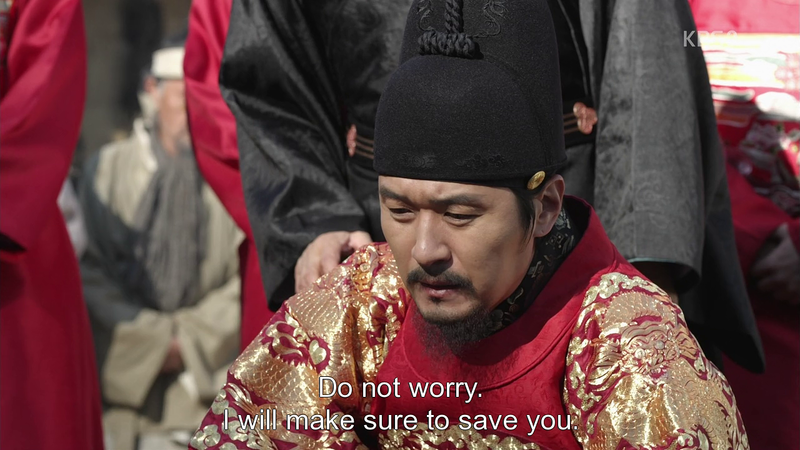 The scene abruptly changes as present-day Sejong wakes up from his dream/flashback/whatever it was with a start. 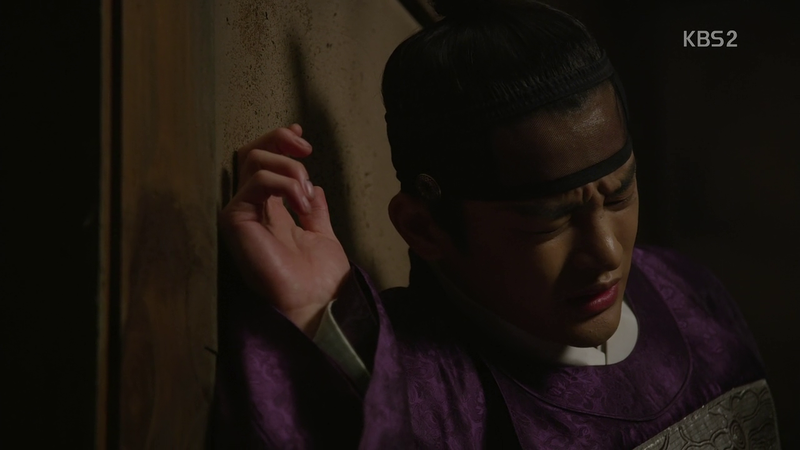 He is brought to one of the many (we are told) areas of suffering within Joseon. People aren’t too happy with the king and have no issue with showing it as they consider themselves as good as dead anyway. 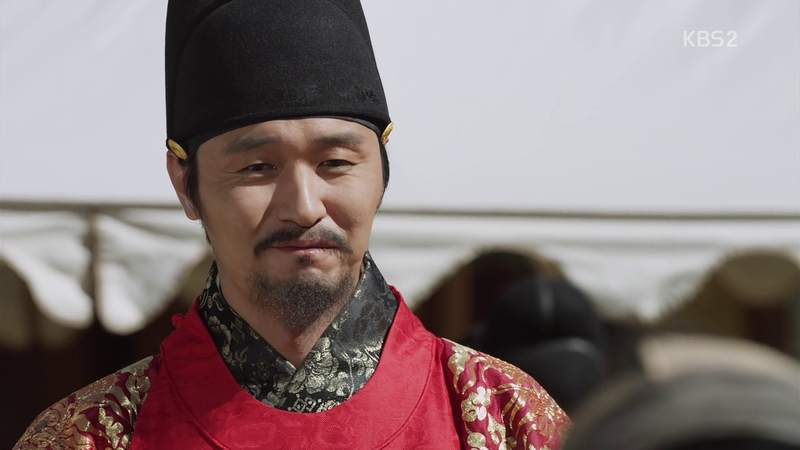 Sejong puts on a warmhearted face and make promises of opening the granaries and the royal cellars, but arranges for those who insulted him to be killed once out of earshot. 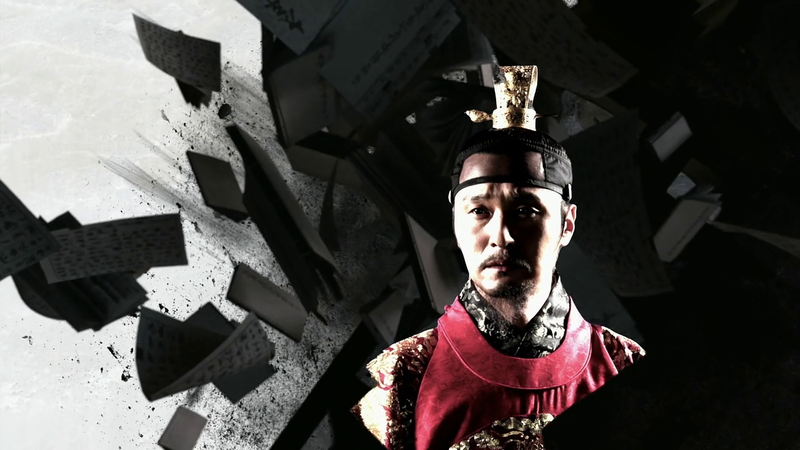 We then meet Prince Gwanghae, son of Sejong, who amazes me by even being able to speak with that many pins in his face. The face reader sticking them in, isn’t the most verbose of men and surprise, surprise, he’s a minion of the king. 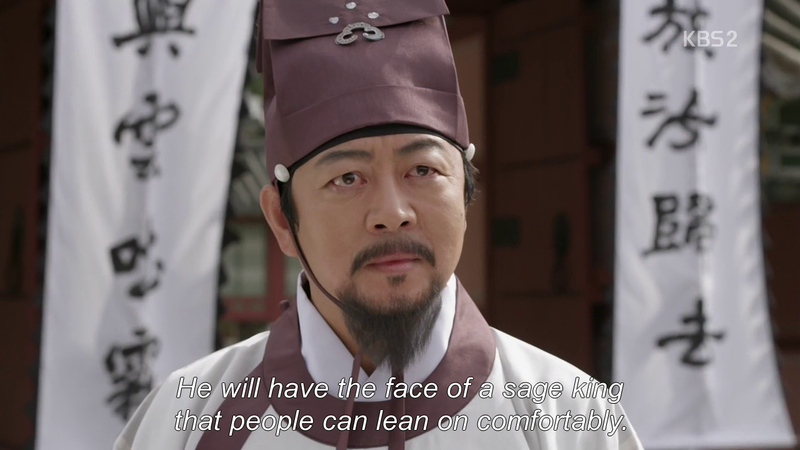 Gwanghae is shown to be quite a merry fellow, and daily receives acupuncture on his face, by order of his father, not knowing that his father plans to do the Joseon equivalent of plastic surgery in order to prevent his son from gaining the ‘King’s face’ or the face that one should have to rule Joseon. 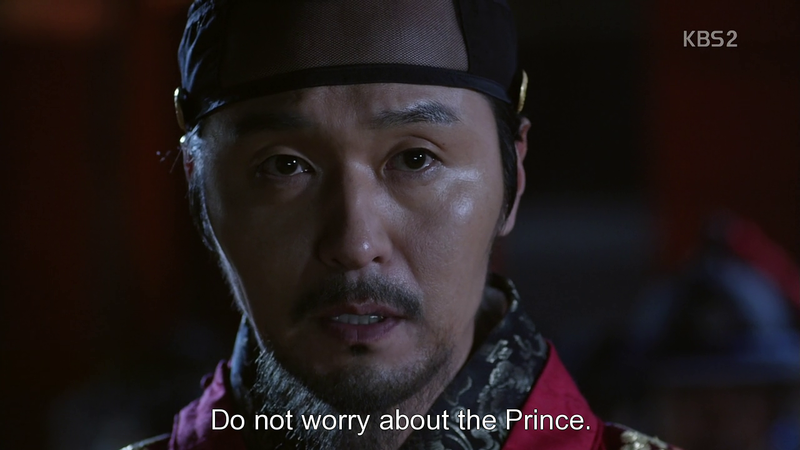 Sejong is also on the hunt for a woman whose features supposed even out his own and will thus lead to a better Joseon. I’m guessing straight off that the woman in questions is going to be our female lead. The royal face reader is appointed the task of finding said woman within a month and doesn’t appear too happy about it either. 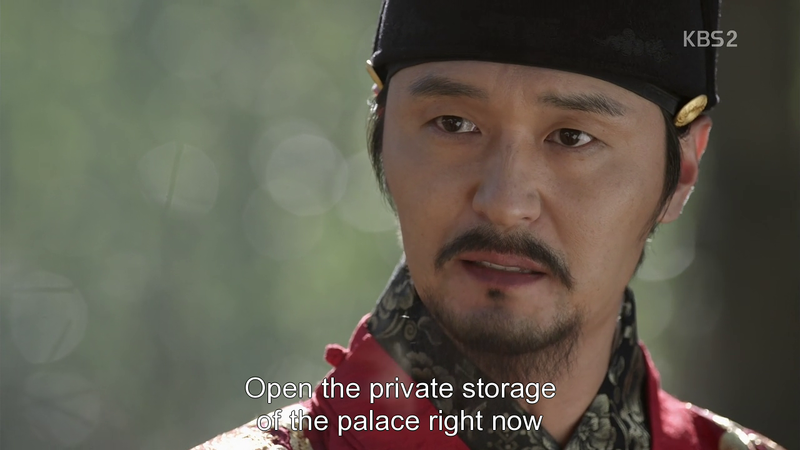 After thieves break into the library and Gwanghae narrowly survives the attack (both by the thieves and his father), he is given a first-hand demonstration of his father’s cruelty as well as the tidbit that the thieves were searching for the Secret Book of the King’s Face, which apparently denotes just who should be king (using physiognomy of course). Gwanghae, having noticed a certainly tattoo inked on one of the thieves, goes on the hunt for him with his faithful manservant. In doing so he meets our female lead, Ga Hee, who lives as a man by both force and choice. 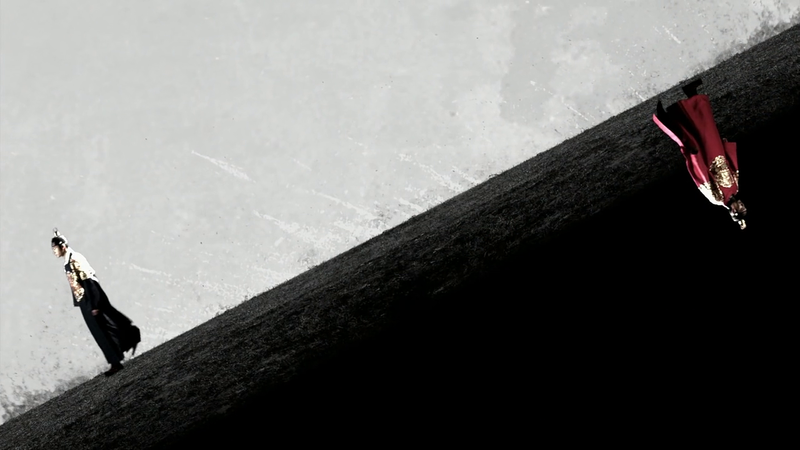 In doing so he discovers the meaning behind the five dots he saw on the thief’s arm. Definitely appears to be a rebel sect of some sort and I’ve a feeling we’re going to see something of them soon! 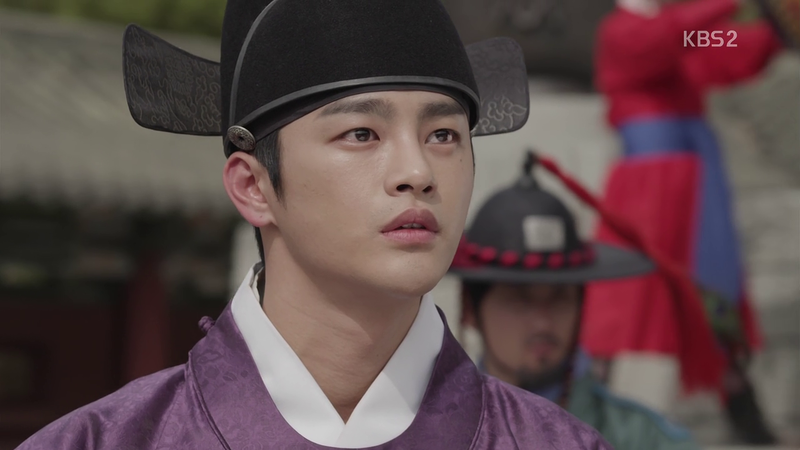 The royal face reader happens to catch sight of Ga Hee when walking in the street and is stupefied that the face he’d been searching so much for was that of a man. He soon loses sight of her though. 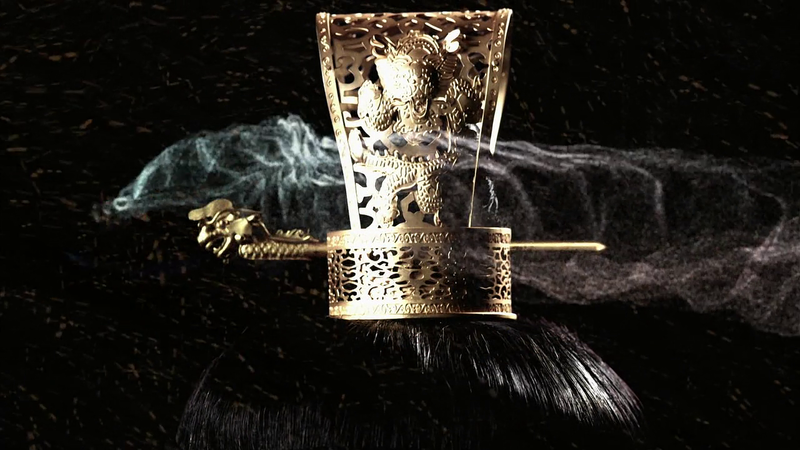 …that she trips into another person and breaks the enormous ceremonial pot used for the ritual and (that’s right) everyone’s eyes are on her. 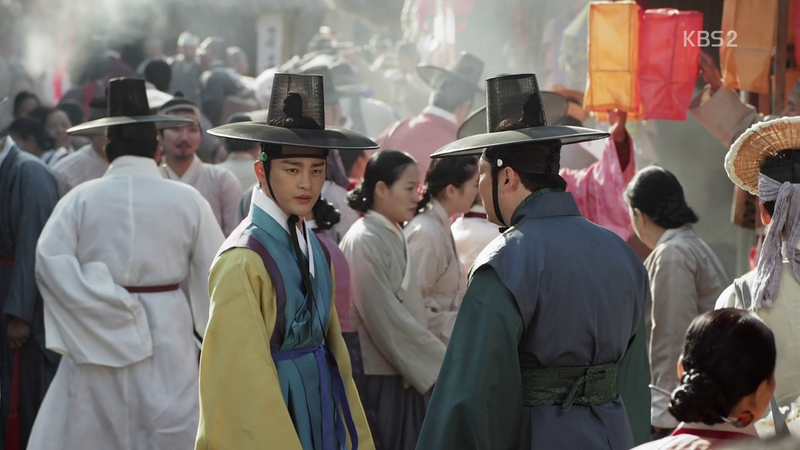 To make things worse, the royal face reader recognizes her as the one who will complement Seonjo’s face, and the same fellow he saw earlier in the streets. The episode ends on every character’s expression of shock. So about those five minutes (skip this paragraph if you don’t want the drama spoiled for you! ), what were the producers thinking? Rather than work as setup, it serves to destroy any sense of anticipation for the remaining episodes as we all know where this is going now. 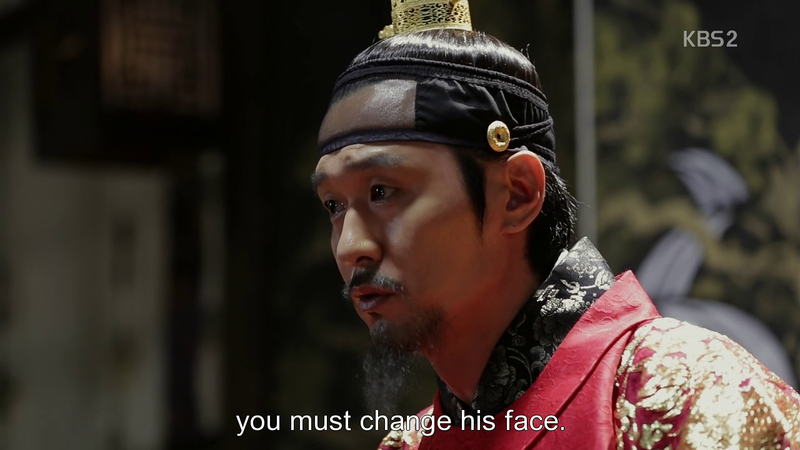 I mean we start off with Ga Hee as Seonjo’s concubine agreeing to his execution of Gwanghae, for heaven’s sake. Not only that, but we see that Gwanghae is married to some faceless woman who wasn’t even mentioned in the casting lineup for the drama, plus he has a kid as well. Judging by the bear on him, this is far, far, into the future, and I hate what started out as such a strong drama (the visuals in that opening intro were beautiful!) let out so much steam straight at the start. Ugh, the only reason I even continued to watch after those disappointing moments was because I thought it was just a fakeout. So much for that. Feels a bit disappointing to know exactly where the trajectory is headed. 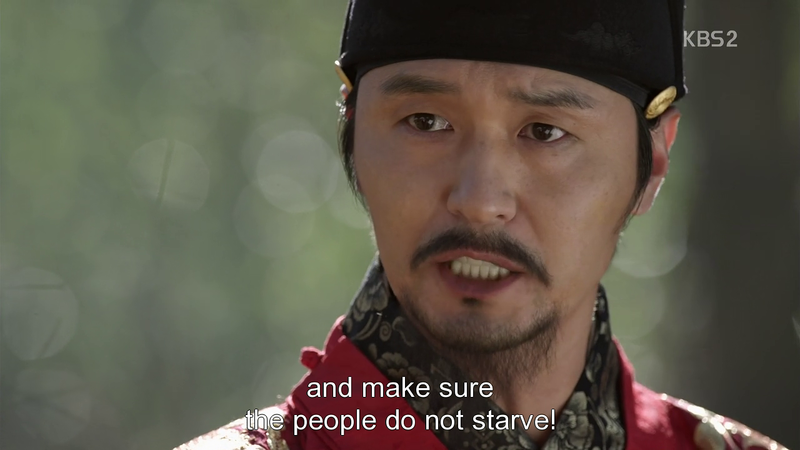 Not having that beginning scene and starting off with the face reader and a young Sejong would have been nice. 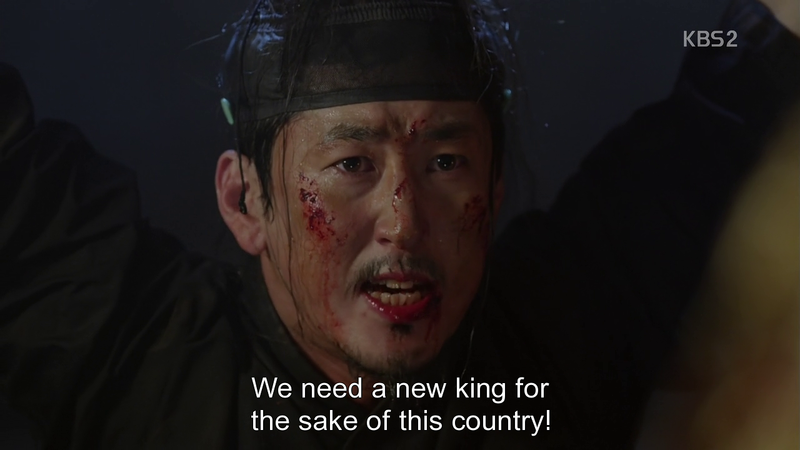 The reason why I thought the first five minutes were a fakeout, was Seonjo’s convincing portrayal of a king who was genuinely concerned about this subjects. That is, until he whispered those words aside. His advisers did seem nervous throughout the entire process. Guess that makes sense not. Ga Hee, seems pretty interesting. 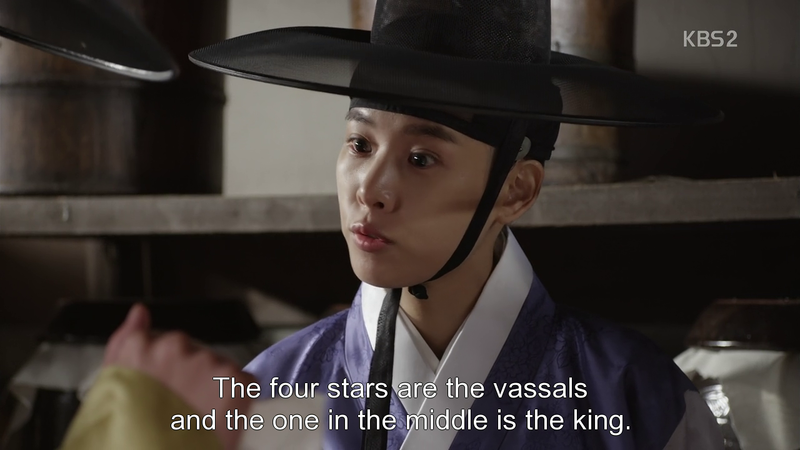 We didn’t spend too long on the childhood arc, which I’m grateful for as some dramas take FOREVER with it (*coughcough* Moon that Embraces the Sun). She seems to definitely care for the Prince and didn’t seem too surprised when it was revealed that the merry stranger she met, was the Prince. Did she know it from the start? I’m actually inclined to think so judging by the odd awkwardness she displayed around him. Same with Gwanghae, there was definitely an odd sort of connection between the two when she was reading within that bookstore, and he kept starting at her. He definitely knows as well and now I’m wondering why he hasn’t been saying anything. 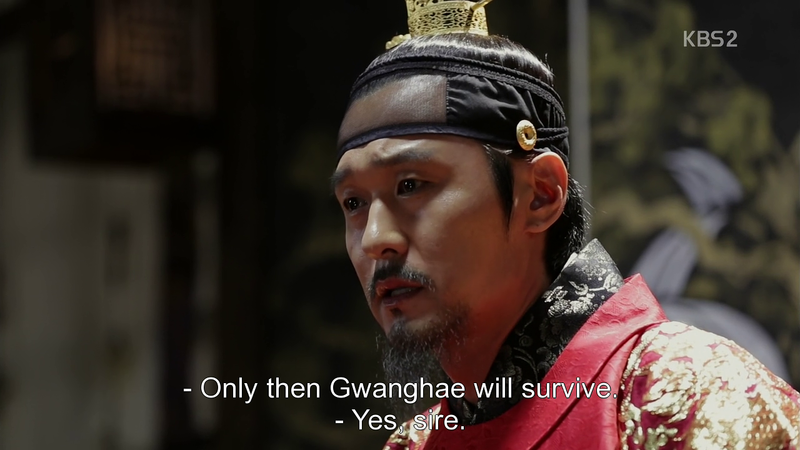 Ga Hee did call him a liar as well, meaning that something must have changed in their relationship for both of them to be reduced to longing looks, Gwanghae more that Gahee, as she doesn’t know that he knows. It’s also interesting in that her father is actually encouraging the cross-dressing, and how she believes she “can forget that she’s a woman”. Is that even possible? 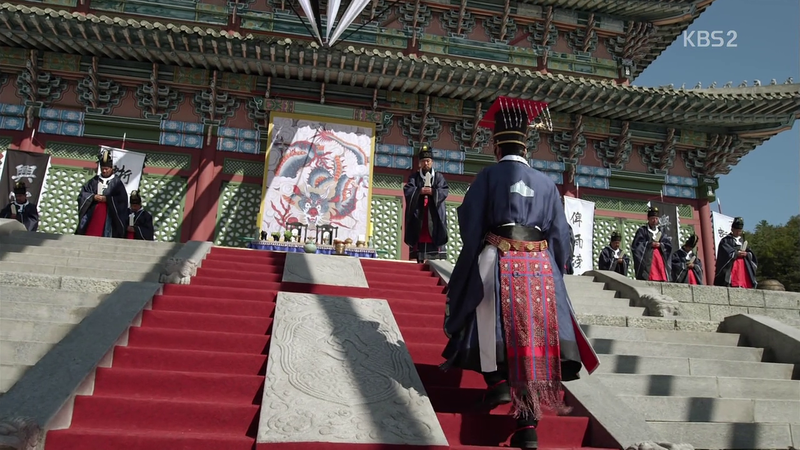 As for the ceremony and the big splash (pun intended) that Ga Hee made. Talk about not drawing attention to yourself, Ms. Obvious. Though we can all argue that it was fated. Fate honestly appears to play a HUGE role in this drama, which naturally leads to the two greatest questions of mankind when it comes to it: Is it in avoiding your fate that you fulfill it? Or would things have turned out the same regardless of whether you let nature run its course? We seem to be going with the former in this case. 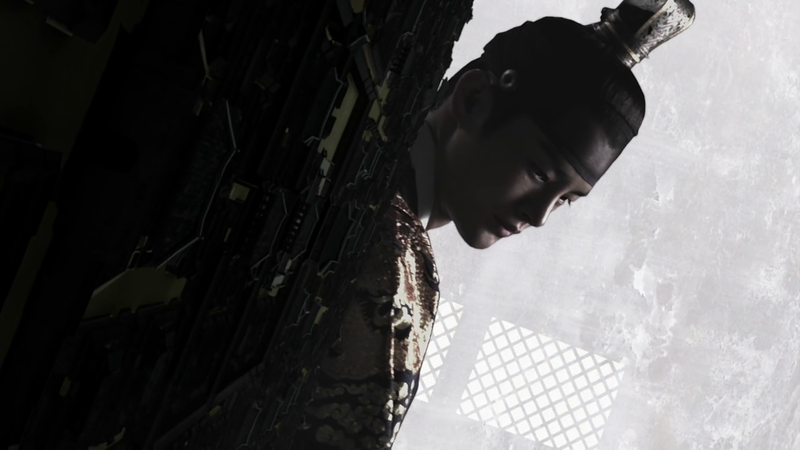 Seonjo’s obsession with remaining King, no matter what, has lead to the troubles that plague Joseon. Well, and the plague as well. There’s an interesting duality demonstrated in his character in that he is willing to do what it takes for his people. That compassion wasn’t entirely a show, yet the remainder of that entirety is what truly defines his character. And boy, does it seal his fate (Pun intended). 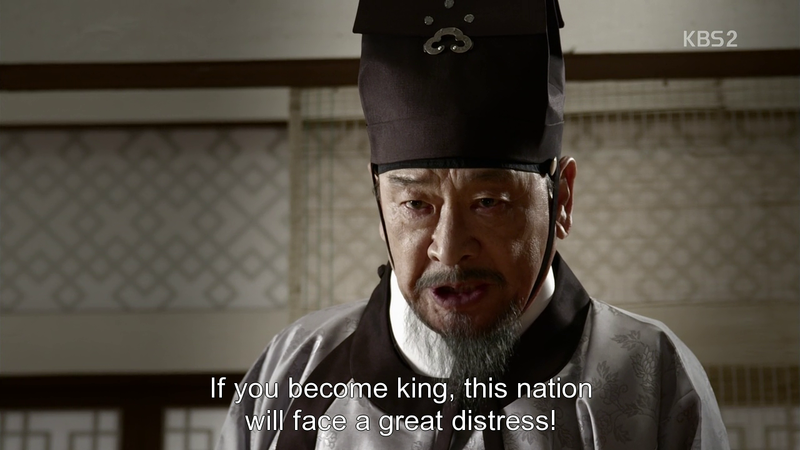 What keeps him from being a great king is the fear and knowledge that he isn’t a great king, part of the same paranoia that characterizes so many dictators past. 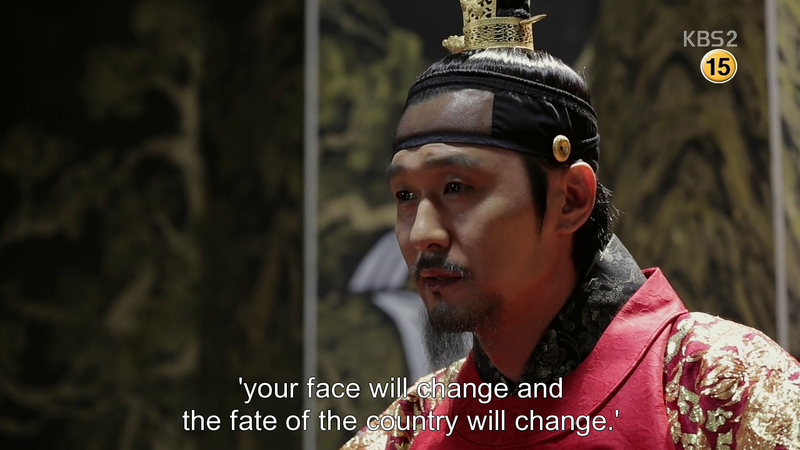 Seonjo does keep reverting to earlier years and the prophetic words of that face reader so he’s pretty aware of this fact. 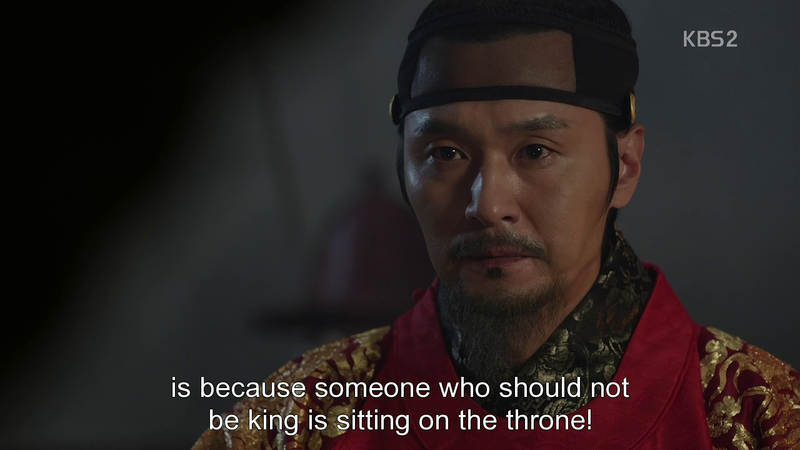 He knows it isn’t his seat but covets it anyway, and thus regardless of much he may want to build a great nation, his attachment to that throne comes first. And a king that puts himself first, is unfit of his position. How much does Gwanghae know/guess? He is aware of his father’s cruelty, he has to be after that scene in the torture room. 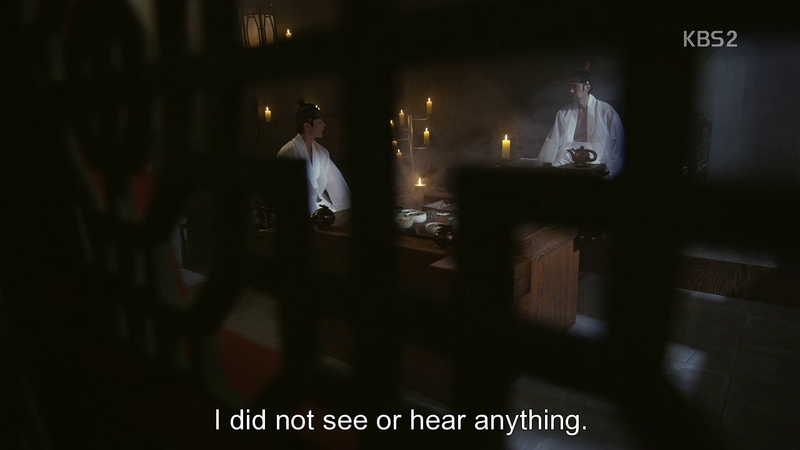 But in accord with the Confucian ideals at the time, he appears to be simply bowing his head and living quietly, in the hope that his father won’t kill him. He seems to have some awareness of what’s happening to his features as well. 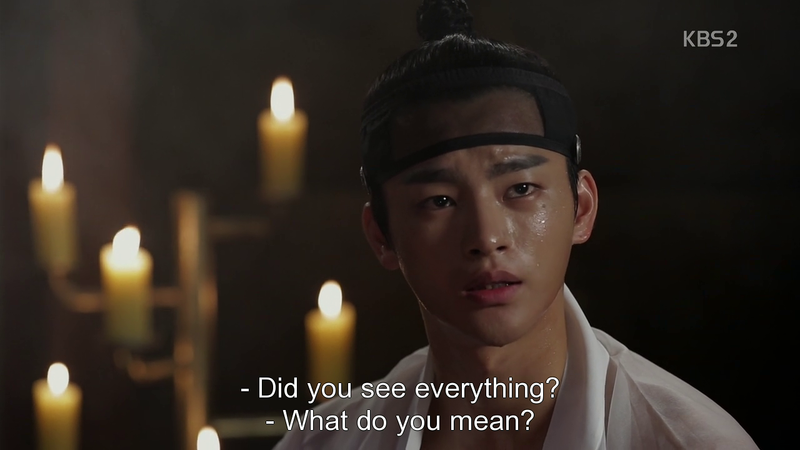 Though that panic-striken look in his eyes as his father strung the bow really spoke volumes as to the trust he had in Seonjo. 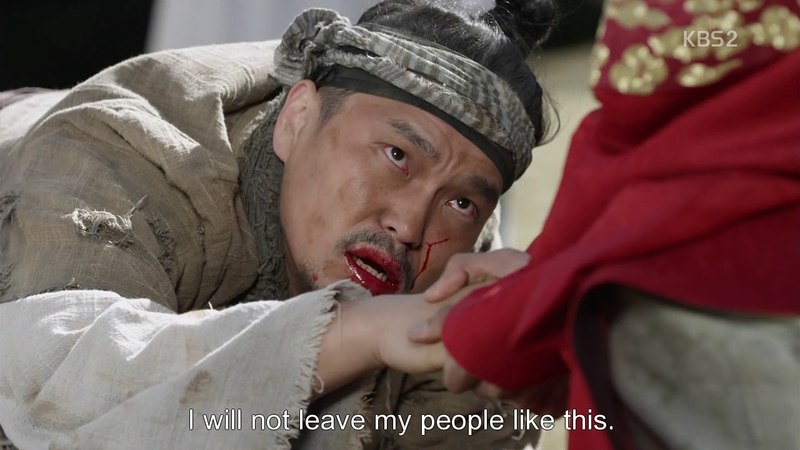 Others would have been assured that the arrow would hit the fellow holding them hostage, yet you could see that Gwanghae doubted that the arrow would even be aimed at the thief clutching him. Gosh, is that sad. 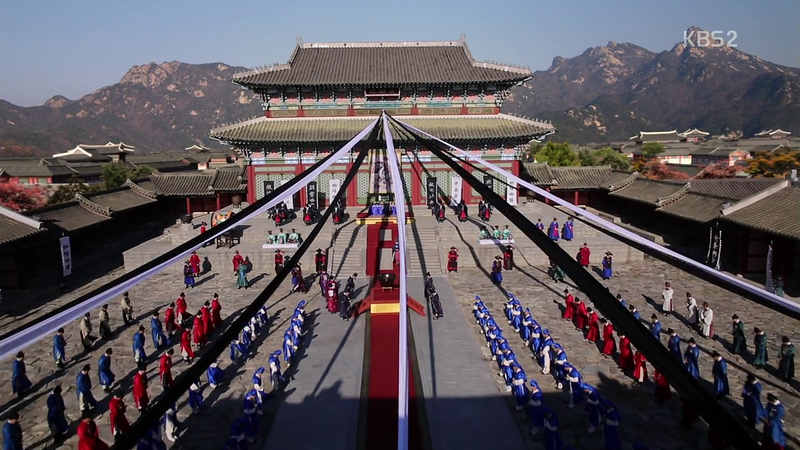 The visuals in this drama are really on point. Besides that lovely opening sequences that just struck all the right chords with me on so many levels, the great colour that permeates throughout this show is really enjoyable to see. I’m also really enjoying the acting in this show so far. 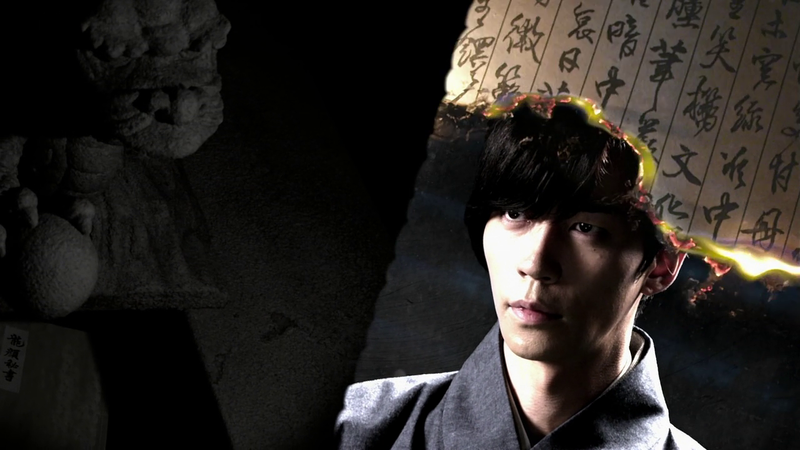 Lee Sung-jae is great as Seonjo. 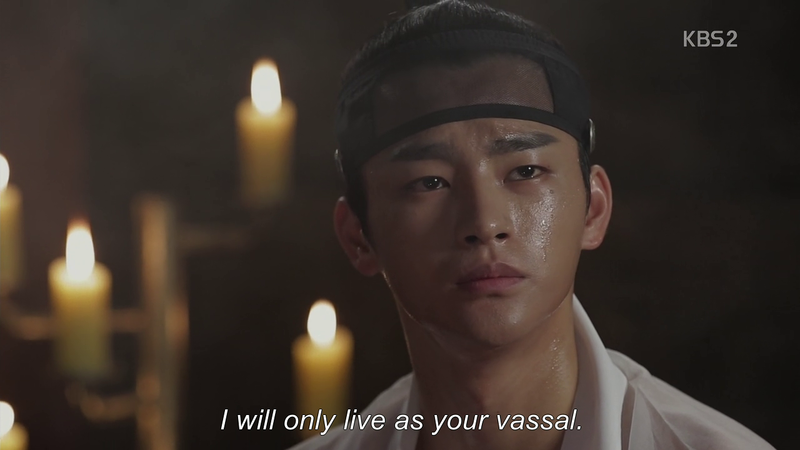 Honestly, he seems to LOVE playing villains, which is great with me because it just gets easier and easier to hate him every time he appears in a drama, and thus you get absorbed into said drama that much faster. 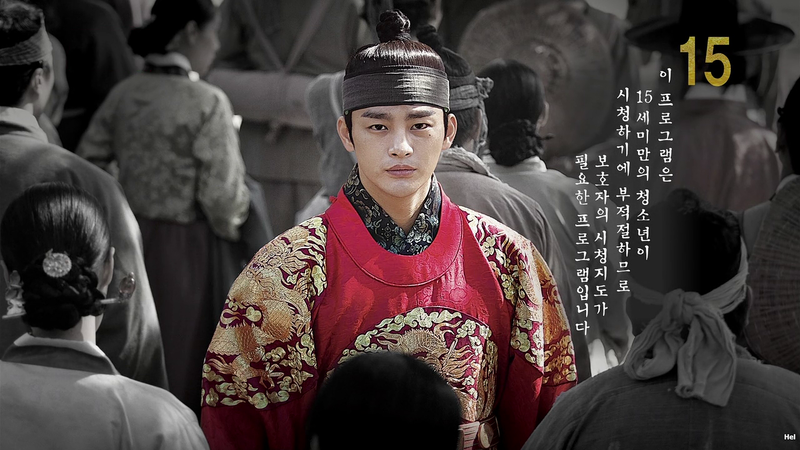 Seo In Guk hits all the right notes as the alternatingly merry, fearful, and clever prince. 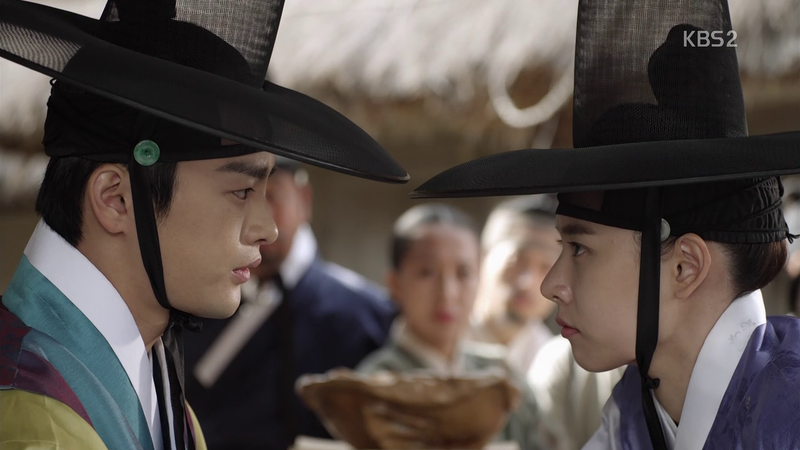 Jo Yoon Hee is actually more believable as a male in Joseon garb than most I’ve ever seen. Only Nam Sang Mi evoked the same effortlessly androgynous feel, that she managed to pull off here. We don’t know too much about Kim Gyuri’s character just yet but she sure appears to be one smart cookie. Should be interesting to see where she fits in within the general scheme of things. But there’s one member of cast missing. Where is SSR and that hair? I did see him in the preview, and can I just say how happy I am to see him on the good/rebel side? I missed you KDY, even if it’s just been a week.